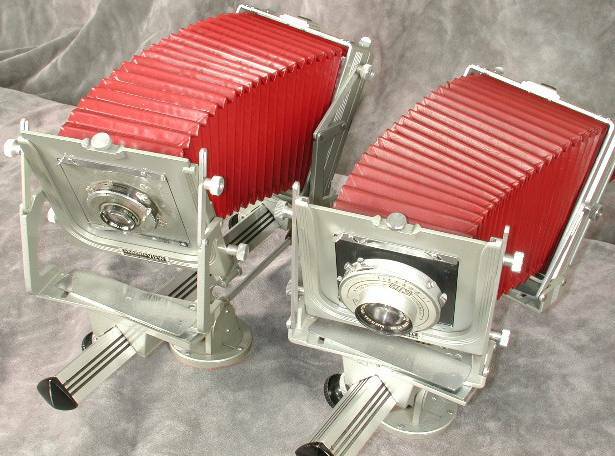 The Graphic View II, seen in the above photo (left), was introduced by Graflex, Inc., in 1949. The photo above shows the View II and the Graphic View with both standards adjusted to maximum tilt and swing. The newer version has a slightly different finish, but you have to look hard to see it. The Graphic View has a satin gray finish on painted metal surfaces. The same parts on the View II are painted with a silver paint that has a slightly mottled look to it. The measurements for the Graphic View II's movements are the same as the original Graphic View’s measurements. The Graphic View II has a four-inch longer monorail and a correspondingly longer bellows extension of 16 inches. The tilts were changed to axis tilts from the Graphic View’s base tilts. With the axis tilts, adjustments of the tilt pivot at the optical axis, and thus affect focus less than the base tilts do. 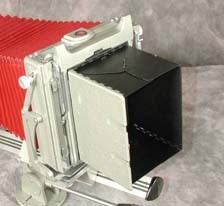 At first, the Graphic View II was available with the same array of Graflex and Graphic backs and reducing backs. 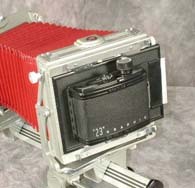 In the early 1950's, Graflex would make a Graflok back by special order. After 1955, the Graflok back was the only back available. 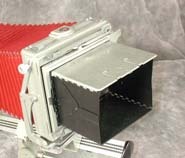 One very useful accessory is an adapter that allows use of 4x5 Pacemaker lens boards on either camera. The adapter attaches to the camera, and any number of Pacemaker lens boards may be used with one adapter.A clever person might consider buying a Super Graphic camera and a Graphic View or View II. 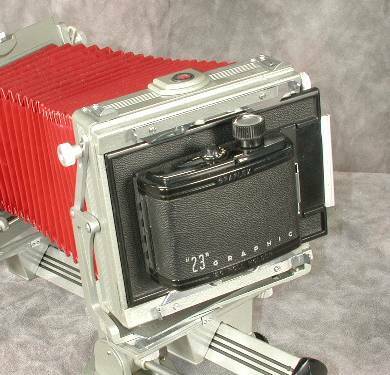 This person could spend money on the best lenses that he/she can afford and an adapter so the mounted lenses could be mounted on Pacemaker boards and used on both of these fine cameras. That combination would cover most situations unless extension of more than 16 inches is needed. Another 3 inches of extension would be available with a Crown view, which could be bought for a couple hundred bucks. Well, maybe that is carrying this Graflex thing too far. The author, for one, does not think so.